The terrible weather forecast for the week leading up to and the day of this year’s Birkbeinerløpet was a blessing in disguise. Although I originally hoped to beat my time from last year, I had to adjust my goals when I saw how much it was going to rain. 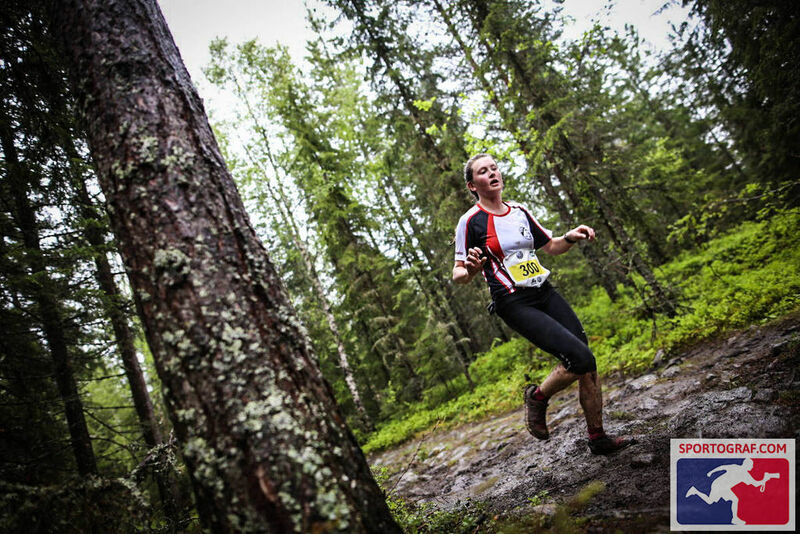 Birkebeinerløpet is a trail half marathon, with damp sections at the best of times. After five days of steady rain it was sure to be an absolute mess. Free from my time goals, I was only nervous about starting in the elite women’s wave. Visions of being dropped by the elite field during the first kilometer danced through my head in the days leading up to the race. But I knew my time last year had qualified me for this wave, so I told myself I belonged there. My strategy was very simple. The first half of the Birkebeiner course is rolling hills and technical terrain; the second half is downhill on fast, mostly gravel trails. Knowing that there were no hills to speak of in the second half, I resolved to race boldly and start much harder on the first section that I had in 2016. The downhills would take care of the themselves. Wet OSI team selfie at the start of Birkebinerløpet. I warmed up in the drizzling rain with my friend Hanne Marte. We jogged the first couple kilometers of the course, and found them to be every bit as bad as I feared. I discovered that the wet grass on the edge of the trail was often less slippery than the soap-like mud on parts of the trail. A gun sounded at Birkbeiner stadium, signifying the depart of the men’s elite field. Hanne Marte and I lined up and wished each other luck, but I let her drift towards the front of the pack while I stayed in the back half. The women’s elite field was surprisingly small, only forty or so women. The gun sounded for our start, and we were off, winding around the stadium before hitting the first steep climb into the woods. I had clung on to the tail end of the field during the fast start, but starting passing women already on the first hill. The first few kilometers were relatively tranquil. The men’s elite field was far ahead of us, and the women’s elite field soon became so spred out that there was only a dozen or so women in my immediate vicinity. Every time I hit a hill, I pushed myself to surge up it, gradually leapfrogging my way past several of my competitors. I blew threw the first aid station without breaking stride, wiping away the rainwater that was dripping from my hair into my eyes. Then the chase packs started to show up. The first non-elite waves in the Birkebeiner are faster than most of the elite women, so soon our quiet forest was filled with men, huffing and puffing and weaving around us. I tried not to pay them much attention, and I continued picking the best possible line through the terrain, letting them take the more dangerous lines to pass me. It was slippery out there. On several sections we were forced to choose between slanted, wet rock or knee deep mud. More afraid of falling and hurting myself than I was of getting covered in mud, my exposed calves soon blended with the black 3/4 tights I was wearing. The rain stopped, but the mud continued. I suddenly noticed that my bib was falling off. The paper had gotten so wet it tore at the safety pin attachments. I hastily unfastened the offending safety pin and shoved it through some fabricate and the paper of me bib, hoping this would hold. It didn’t; the two top safety pins came undone once again a little later in the race. There was a timing mat at 8K, and I realized I had no idea whether I was ahead or behind of my previous time. I also kind of didn’t care. This was a completely different race than last year, and all I could do was race by feel. I felt pretty decent, all things considered. I had chugged some sports drink at the aid station, and it first made me have to burp, and then I got a side stitch. 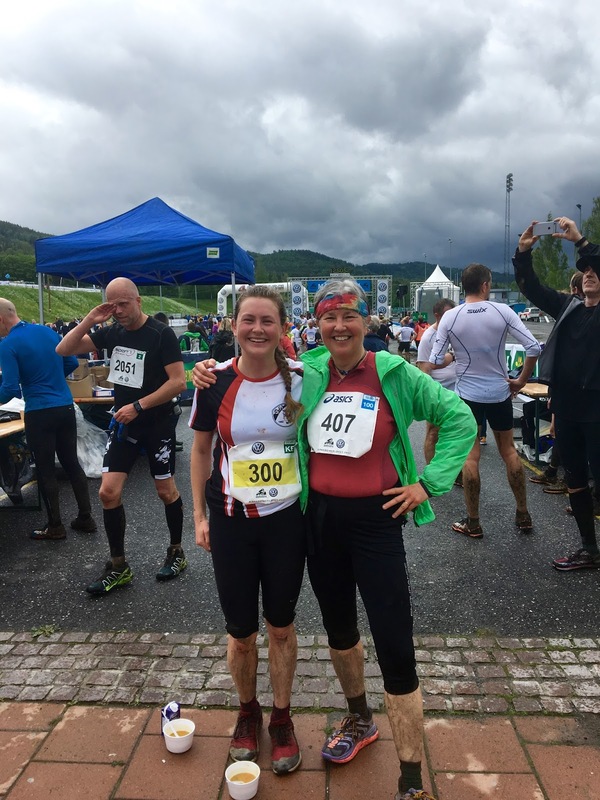 My mind abruptly wandered to the demon side stitch of Oslo Ecotrail 2016. No, I told myself, I REFUSE to let it get that bad. I am going to keep running, and this side stitch will go away. This time my body listened to me, and the side stitch faded. We were over the worst of the hills now, and I was looking forward to the downhill. Suddenly, I tripped and went down on both knees. Three women passed me, asking if I was alright, as I picked myself up and charged on. “I hit my knees pretty hard,” I admitted, “But they’re numb, so I’ll think about that at the finish line." I latched on the trio of women, relishing the opportunity to race with them. I was last in the pack at first, but eventually climbed behind the leader. 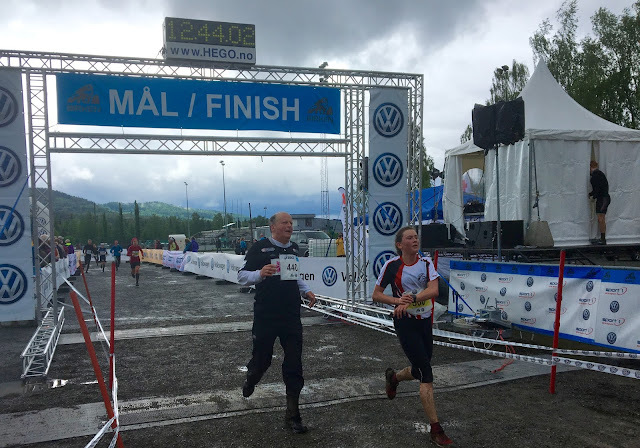 I struggled to keep her pace, even as we headed into the downhill section, but knew that clinging on with all my might was my best chance of a strong finish. We dropped the other two women, and I struggled to close the gaps that appeared between me and the leading woman as we dashed madly down mudslicked slopes. I lost my companion with around 4K to go, by being too timid in a particularly muddy section. I wasn’t interested in crashing again. Coming through the home stretch. Before the final kilometer, the course throws a final, steep hill. Rune, a team mate from OSI, was standing on the hill, cheering with all his might. I sprinted up the hill, lactic acid surging in my legs as I told myself only one more K! I hadn’t dared to look at my watch for most of the race, afraid of being discouraged by what was sure to be a slower time than last year. During the last couple kilometers I had started to glance at the elapsed time, doing some quick mental arithmetic. It was encouraging, and I ran hard for the last kilometer, hoping to squeak under 1:40 once again. Imagine my surprise when I stopped my watch at a time of 1:39:00, 24 seconds faster than laster year! The race leaders were slowed down nearly 3 minutes compared to 2016 by the muddy conditions, which means 1:39 this year would be worth 1:36 or 1:37 in a drier year. And far from being at the tall end of the elite women’s field, I finished 23rd out of 44! My knees were blooded but soul was soaring with the satisfaction of a race well run. Mother-daughter post race pictures. 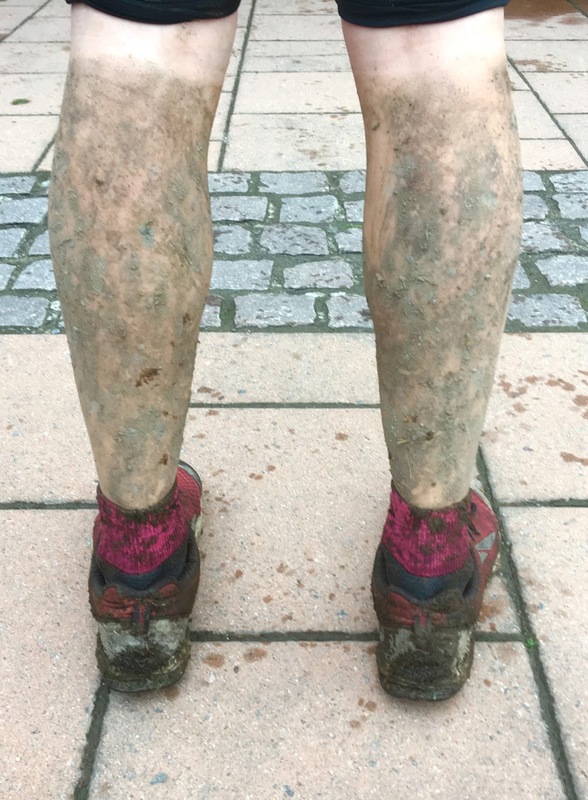 Note the equally muddy calves. Mom and Dad also raced the half marathon distance, running respectable times despite the adverse conditions. 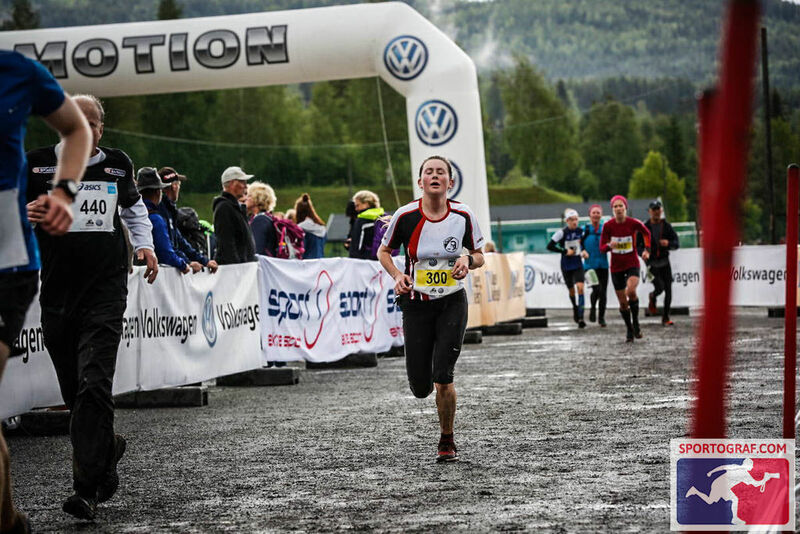 My friend Hanne Marte blew it out of the park in 1:33. After the race, I watched some friends of the family running the kid's race. It was pretty entertaining to see 10-years coming through the final stretch of the 1.5K race, fists balled up and faces clenched in apparent agony. I hope I can race with that much pure intensity and focus; I feel like I was pretty close to that at Birkebeinerløpet this year. I can't even imagine how hard this race was. I love all the details, it felt like I was right there with you. Congrats on the PR!